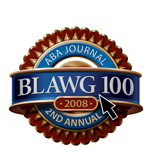 Each year the American Bar Association publishes a list of the top 100 legal blogs. This year, the ABA has recognized this site as a one of the top 100 legal blogs – and the only legal blog dealing with bankruptcy, credit and debt issues. So please pardon us as we take a moment – just a small one, we promise – to reflect on the hard work we’ve put into trying to make this site the most comprehensive resource for consumer bankruptcy information online. None of it would be possible without our loyal readers who turn to us for reliable information rather than the misinformation that’s often peddled online. We’re all proud of the fact that the ABA saw fit to recognize our blog above all others out there, and look forward to continuing to make Bankruptcy Law Network even more useful in the months and years ahead.